You are here: Home / Great Deals / Cricut Explore One Bluetooth Bundle Just $169! Down From $250! Cricut Explore One Bluetooth Bundle Just $169! Down From $250! Right now you can get this Cricut Explore One Bluetooth Bundle for just $169 (Reg. $250) at Walmart! 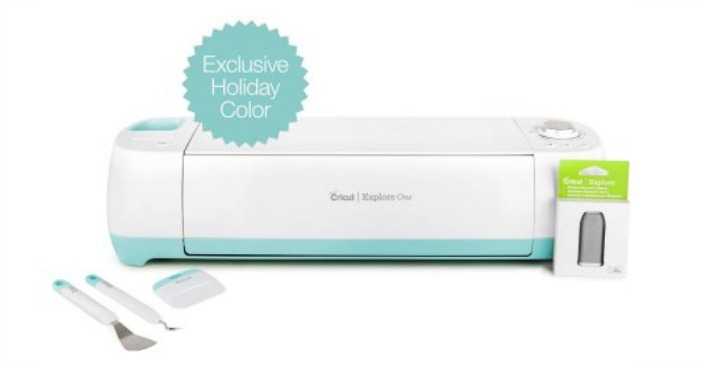 Get instantly inspired with the beautiful, color-coordinated Cricut Explore One Bluetooth Bundle! This special edition includes the cutting machine in splashy Pastel Turquoise with matching essential tools, a Bluetooth Adapter for wireless capabilities and more. Use the free Design Space software and app for computer, Apple iPad and iPhone. This powerful design-and-cut system includes features such as offline mode so you can design without an internet connection and SnapMat for precise design placement. You also get a free 3-month Cricut Access membership with unlimited use of over 30,000 images, 1,000 Make It Now projects and 370 fonts. With Cricut, you can upload your own images, too, and cut over 60 different materials for true personalization and endless possibilities!